TELL US A LITTLE BIT ABOUT YOUR STORY – WHAT IS YOUR BACKGROUND AND HOW AND WHY DID ORRIS COME ABOUT? My interest in fragrance began 15 years ago. When I had the idea of going into fragrance, I began experimenting with raw materials myself, failed miserably on creating anything worthwhile, spent endless hours researching everything I could find on perfume, and then ended up working with outside fragrance houses to develop our very first young, but now defunct fragrance brand. After years of success and then a break from the business, I began tinkering with materials again. I eventually became good at composing fragrances. In 2012, together with my husband, we founded our company, Capsule Parfumerie. I formulate all the fragrances in our company, while my husband acts as an evaluator. We currently produce 6 different brands under our umbrella. Orris is our first brick-and-mortar store. WHAT IS UNIQUE ABOUT ORRIS? Orris is a place to experience and discover everything we make. We offer espresso, play records, and provide warm and friendly service. There is a satellite lab in the back of the store where guests can get a glimpse into our creative process and how we craft everything by hand. Starting in October, we will begin offering perfume-making workshops. WHAT IS YOUR PROCESS FOR CREATING A NEW SCENT? My process always starts with the raw materials, then ideas form from there. I have a wonderful relationship with my suppliers, who send me beautiful, high quality ingredients from all over the world – some being rare, expensive and limited in supply. If a material moves me, it will inspire a new creation. I only work with ingredients that speak to me and draw me in. As weird as it may sound, I do believe they have a voice and I develop special bonds with them. Naturals especially have a high vibration and frequency that can be felt. Occasionally I get silly in my lab. You may catch me talking to and caressing my materials. I ask them to reveal themselves to me and I let intuition guide my work. YOUR LATEST LINE AUREUM BOTANICA IS CONSTRUCTED OF NATURAL BOTANICALS. WHAT CHALLENGES DID THIS PRESENT AS A CLEAN PERFUME, AND HOW DID YOU OVERCOME THEM? 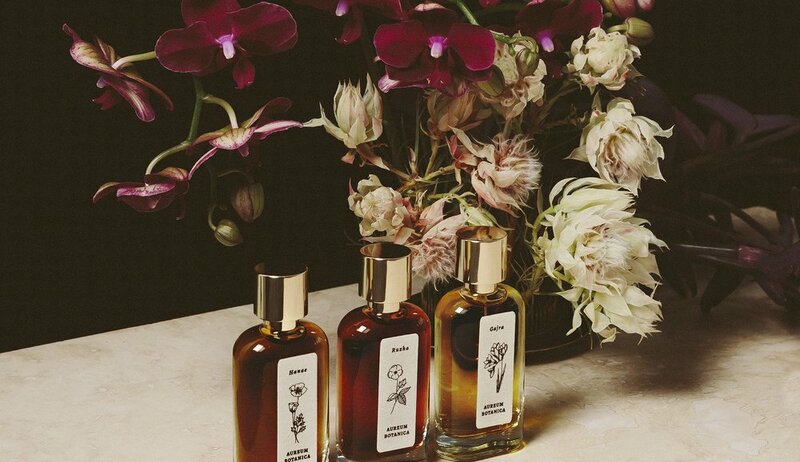 It took me a considerable amount of time to develop our Aureum Botanica line, and my vision for it was to create contemporary luxury fragrances, void of any synthetics. I wanted to celebrate the luminescence of plants and chose ingredients that are really unique and complex. Using natural materials exclusively can be challenging because they tend to take on a life of their own and can be hard to control. There are variances from crop to crop and suppliers, so results can be unpredictable. Some materials are also costly and tricky to work with (some require slow and gentle heating before they can be used). I only work with reputable companies when buying my materials. I also make our own tinctures using produce purchased at local farmers markets. We take great time and care when working with and evaluating each ingredient because it is not as simple as just following a recipe or formula. We have to adjust every batch we make. It is tedious work, but when done well, the result is worth the extra effort- especially for those seeking a natural perfume. WHAT SHOULD PEOPLE LOOK FOR IN A PERFUME TO ENSURE QUALITY AND LOW TOXICITY? I guess you can start with the ingredient labeling, although most companies will not list everything. There is so much work that goes into a beautiful, well-constructed perfume and it should be treated as creative intellectual property, but unfortunately is not protected as such. Labeling can also be confusing. It is important to note however, that a natural product does not automatically mean it is a quality product and is non-toxic. My suggestion would be to spend time researching and address questions to the fragrance house if you have concerns. WHAT ADVICE WOULD YOU GIVE TO PEOPLE TRYING TO FIND THEIR SIGNATURE SCENT? There are some interesting fragrance blogs and forums to discover perfume and read reviews on both classic and new launches. I think to find your signature scent, it is best to simply try anything you’re curious about, test it in a store or buy samples online, live with it, and pay attention to how you feel when you smell yourself and how others react to you when they smell you wearing it. If your experience is positive, if it is memorable, if strangers are doing a double-take in your passing, if friends are compelled to compliment you or ask you what you’re wearing, I say you have a winner. I believe that fragrance is one of life’s greatest pleasures, and you can consider yourself lucky if you can find more than just one signature scent. I recommend wearing perfume in your hair and on the nape of your neck, on your wrists and forearms, inside your shirt and chest (where it’s warm), or scent an accessory such as a scarf. During intimacy, perfume on the back of the knees and the small of the back is a nice surprise. Wear fragrance everyday, throughout the day and into the night, and as often as your mood changes! I often see people spray scent into the air and walk into it. I would encourage you to find something you love and spray it directly on you. If it’s a strong scent, spray once, if light, spray a few times, but commit to it…don’t be shy!